Driving on the left is NOT "driving on the wrong side." About half of the drives in the world do. Some travelers say that's not for them... They will never drive in a country where they need to do that. It's true some things might be hard to gauge if you pick up a rental car and need to "stay left" when you're used to driving on the right. You're used to driving on the left, but now you visit where we drive on the right. ...things are just the opposite. But really, either way, it's a lot easier than you might think. ...in Africa and in some Caribbean Islands. 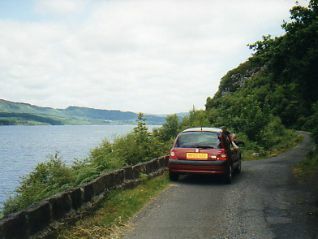 Here we are driving on a country road in Scotland. OK... it WAS only one lane wide, but that just made it more of an adventure! We're getting ready for a short driving trip in England, so it brought some tips to mind. You just have to stay extra alert all the time. Not only are you driving on the left, the driver is now sitting on the right side of the car. A Stick Shift? OH NO! The most economical cars to rent come with a standard or manual transmission. ...So you will be shifting with your left hand. It might be worth a few extra dollars to reserve a rental car with an automatic transmission.... you'll still have to master driving on the left, but at least you won't have to shift too! Get all the help you can from your friends. Staying on the left side of the road starts to come more easily after the first few miles, but I freely "backseat drive"... or actually passenger seat drive. It's easier for me to judge the lane lines and how close we are. When we drive on the left, as a passenger, I'm in the left seat and this gives me my normal driver's perspective... so I find myself saying "You're a little close to the line." Take your time so you don't damage your rental car. You'll enter roundabouts by heading to the left. Remember traffic in roundabouts has the right of way, so you need to look to your right for oncoming traffic. You don't necessarily stop to enter a roundabout, but you should slow and yield to any traffic before entering. The first roundabouts Mark ever encountered were in England, driving on the left... so that comes more naturally to him than some of the new roundabouts at home! Left and right turns can feel strange at first, but soon you'll be turning just fine. My biggest problem as navigator is I will sometimes say turn left when I mean right, because now a right turn is across traffic. Once I get the direction right, the driver, Mark, does just fine! Which is the slow lane on the motorway? On highways and motorways, the "slow" lanes are the outside lanes, and when you're driving on the left that means they are the left lane. That's where you'll get on, and you may just want to stay in that lane until you feel comfortable. Don't let motorways, autobahns and freeways scare you. In some ways they are easier than city streets. The traffic is all flowing WITH you... no turns and stops to worry about. People use them that way! ...And move back to the slower lanes after passing. 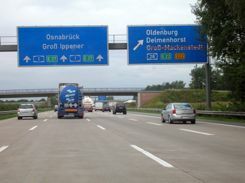 We have a page on Autobahn etiquette that will fill you in a little more on that. Yes, You can do it.... just don't become too smug! ...and you are less alert. If you turn on to a road with no other cars for reference, you may find yourself heading back to that more familiar right side of the road. We did that once after dinner, in the dark in Namibia... whew, we were really glad there were no other cars on the road! Watch yourself leaving and entering car parks (that's parking lots) too. But You DO drive on the left at home? As we said at the top, you can pretty much reverse all of these suggestions if you're used to driving on the left, but you are now vacationing in a country where you drive on the right. It goes both ways... right? Left? Right?